Artpace: New Works: 05.1, curated by Victor Zamudio-Taylor, confronts the viewer with the power of ideology, identity, and society through the work of three artists who live in liminal states between cultures that are meeting like tectonic plates, sometimes subsuming, sometimes succumbing, but always combining in irrevocable new wholes. Zamudio-Taylor says that he is interested in the work of artists who live in physical and mental borderlands because that is increasingly the global human condition. Viewed from this perspective, individuals are constantly in the process of being liberated from the definitions of their birth culture but they may adopt in their place another, equally tyrannical, identity and ideology. And these transitioning individuals - or transitioning identities - comprise a new state of uncertainty and instability that drives at least as many people toward dogma as it does toward some limited liberation. Los Angeles-based Daniel Joseph Martinez is the Thompson Submachine Gun of conceptual art: He fires so fast and frequently, and yet he’s remarkably accurate. The gallery notes for his Artpace exhibit, "A Meditation on the Possibility of Romantic Love or Where You Goin’ With That Gun In Your Hand, Bobby Seale and Huey Newton Discuss the Relationship Between Abstract Expressionism and Social Reality in Hitler’s Paintings," claim that he exposes common threads among various utopian ideologies, but in fact his deconstruction goes a step further and accomplishes something more profound and disturbing. Large, square canvases, thick with matte-white pigment line the room, each accompanied by excerpts from Hitler’s Mein Kampf on the need for idealism, the need to convert philosophy into action, the power of a crowd that has yet to force its philosophy into law. From the windows, small white silhouettes of former Black Panthers Newton and Seale watch the room, almost invisible. As the viewer moves close enough to the canvases to see the flaws in their surfaces, a critical clockwise reading of the text reveals how the human desire for philosophy and idealism engenders a system of will to power and enslavement. 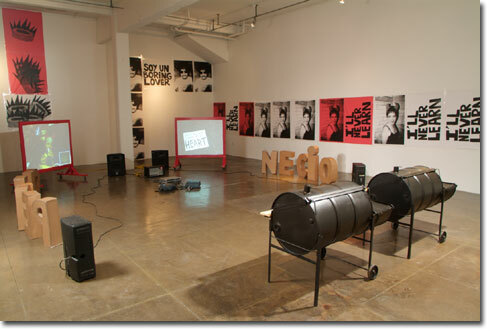 In the final analysis, Martinez’s installation argues, it is the human condition itself that is to be rebelled against. Conversations with Martinez confirm the sense one gets from his recent work that he is in the process of rejecting as many definitions that can be imposed on a human as he can. Yet, his spirit isn’t nihilist, and neither is this installation.